The multitude stationed without the doors of the Institute had made way for those coming out, every one being eager to learn the particulars of the session. 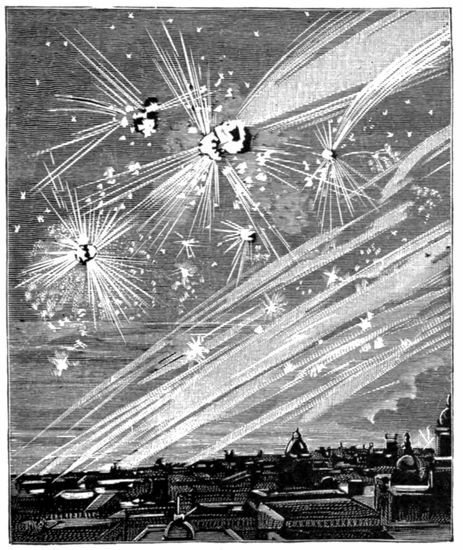 Already the general result had in some way become known, for immediately after the speech of the director of the Paris observatory the rumor got abroad that the collision with the comet would not entail consequences so serious as had been anticipated. Indeed, large posters had just been placarded throughout Paris, announcing the reopening of the Chicago stock exchange. This was an encouraging and unlooked for indication of the resumption of business and the revival of hope. This is what had taken place. The financial magnate, whose abrupt exit will be remembered by the reader of these pages, after rolling like a ball from the top to the bottom row of the hemicycle, had rushed in an aero-cab to his office on the boulevard St. Cloud, where he had telegraphed to his partner in Chicago that new computations had just been given out by the Institute of France, that the gravity of the situation had been exaggerated, and that the resumption of business was imminent; he urged, therefore, the opening of the central American exchange at any cost, and the purchase of every security offered, whatever its nature. When it is five o’clock at Paris it is eleven in the morning at Chicago. The financier received the despatch from his cousin while at breakfast. He found no difficulty in arranging for the reopening of the exchange and invested several millions in securities. The news of the resumption of business in Chicago had been at once made public, and although it was too late to repeat the same game in Paris, it was possible to prepare new plans for the morrow. The public had innocently believed in a spontaneous and genuine revival of business in America, and this fact, together with the satisfactory impression made by the session of the Institute, was sufficient to rekindle the fires of hope. No less interest, however, was manifested in the evening session than in that of the afternoon, and but for the exertions of an extra detachment of the French guard it would have been impossible for those enjoying special privileges to gain admission. Night had come, and with it the flaming comet, larger, more brilliant, and more threatening than ever; and if, perhaps, one-half the assembled multitude appeared somewhat tranquillized, the remaining half was still anxious and fearful. The audience was substantially the same, every one being eager to know at first hand the issue of this general public discussion of the fate of the planet, conducted by accredited and eminent scientists, whether its destruction was to be the result of an extraordinary accident such as now threatened it, or of the natural process of decay. But it was noticed that the cardinal archbishop of Paris was absent, for he had been summoned suddenly to Rome by the Pope to attend an œcumenical council, and had left that very evening by the Paris-Rome-Palermo-Tunis tube. “The immense crowd gathered within these walls, the emotion I see depicted upon every face, the impatience with which you await the discussions yet to take place, all, gentlemen, would lead me to refrain from laying before you the opinion which I have formed from my own study of the problem which now excites the interest of the entire world, and to yield the platform to those gifted with an imagination or an audacity greater than mine. For, in my judgment, the end of the world is not at hand, and humanity will have to wait for it several million years—yes, gentlemen, I said millions, not thousands. “You see that I am at this moment perfectly calm, and that, too, without laying any claim to the sang froid of Archimedes, who was slain by a Roman soldier at the siege of Syracuse while calmly tracing geometric figures upon the sand. Archimedes knew the danger and forgot it; I do not believe in any danger whatever. “In that case, gentlemen,” resumed the president of the geological society of France, “I shall explain to you what, in my judgment, will be the natural end of the world, if, as is probable, nothing disturbs the present course of events; for accidents are rare in the cosmical order. “Nature does not proceed by sudden leaps, and geologists do not believe in such revolutions or cataclysms; for they have learned that in the natural world everything is subject to a slow process of evolution. The geological agents now at work are permanent ones. “The destruction of the globe by some great catastrophe is a dramatic conception; far more so, certainly, than that of the action of the forces now in operation, though they threaten our planet with a destruction equally certain. Does not the stability of our continent seem permanent? Except through the intervention of some new agency, how is it possible to doubt the durability of this earth which has supported so many generations before our own, and whose monuments, of the greatest antiquity, prove that if they have come down to us in a state of ruin, it is not because the soil has refused to support them, but because they have suffered from the ravages of time and especially from the hand of man? The oldest historical traditions show us rivers flowing in the same beds as today, mountains rising to the same height; and as for the few river-mouths which have become obstructed, the few land-slides which have occurred here and there, their importance is so slight relatively to the enormous extent of the continents, that it seems gratuitous indeed to seek here the omens of a final catastrophe. “Such might be the reasoning of one who casts a superficial and indifferent glance upon the external world. But the conclusions of one accustomed to scrutinize closely the apparently insignificant changes taking place about him would be quite different. At every step, however little skilled in observation, he will discover the traces of a perpetual conflict between the external powers of nature and all which rises above the inflexible level of the ocean, in whose depths reign silence and repose. Here, the sea beats furiously against the shore, which recedes slowly from century to century. Elsewhere, mountain masses have fallen, engulfing in a few moments entire villages and desolating smiling valleys. Or, the tropical rains, assailing the volcanic cones, have furrowed them with deep ravines and undermined their walls, so that at last nothing but ruins of these giants remain. “More silent, but not less efficacious, has been the action of the great rivers, as the Ganges and the Mississippi, whose waters are so heavily laden with solid particles in suspension. Each of these small particles, which trouble the limpidity of their liquid carrier, is a fragment torn from the shores washed by these rivers. Slowly but 81surely their currents bear to the great reservoir of the sea every atom lost to the soil, and the bars which form their deltas are as nothing compared with what the sea receives and hides away in its abysses. How can any reflecting person, observing this action, and knowing that it has been going on for many centuries, escape the conclusion that the rivers, like the ocean, are indeed preparing the final ruin of the habitable world? “Geology confirms this conclusion in every particular. It shows us that the surface of the soil is being constantly altered over entire continents by variations of temperature, by alterations of drought and humidity, of freezing and thawing, as also by the incessant action of worms and of plants. Hence, a continuous process of dissolution, leading even to the disintegration of the most compact rocks, reducing them to fragments small enough to yield at last to the attraction of gravity, especially when this is aided by running water. Thus they travel, first down the slopes and along the torrent beds, where their angles are worn away and they become little by little transformed into gravel, sand and ooze; then in the rivers which are still able, especially at flood-times, to carry away this broken up material, and to bear it nearer and nearer to their outlets. “It is easy to predict what must necessarily be the final result of this action. Gravity, always acting, will not be satisfied until every particle subject to its law has attained the most stable position conceivable. Now, such will be the case only when matter is in the lowest position possible. Every surface, must therefore disappear, except the surface of the ocean, which is the goal of every agency of motion; and the material borne away from the crumbling continents must in the end be spread over the bottom of the sea. In brief, the final outcome will be the complete levelling of the land, or, more exactly, the disappearance of every prominence from the surface of the earth. “In the first place, we readily see that near the river mouths the final form of the dry land will be that of nearly horizontal plains. The effect of the erosion produced by running water will be the formation on the water-sheds of a series of sharp ridges, succeeded by almost absolutely horizontal plains, between which no final difference in height greater than fifty meters can exist. “If, then,” resumed the geologist, “nothing occurs to modify the reciprocal action of land and water, we cannot escape the conclusion that every continental elevation is inevitably destined to disappear. “How much time will this require? “The dry land, if spread out in a layer of uniform thickness, would constitute a plateau of about 700 meters altitude above the sea-level. Admitting that its total area is 145,000,000 square kilometers, it follows that its volume is about 101,500,000, or, in round numbers, 100,000,000 cubic kilometers. Such is the large, yet definite mass, with which the external agencies of destruction must contend. “Taken together, the rivers of the world may be considered as emptying, every year, into the sea 23,000 cubic kilometers of water (in other words, 23,000 milliards of cubic meters). This would give a volume of solid matter carried yearly to the sea, equal to 10.43 cubic kilometers, if we accept the established ratio of thirty-eight parts of suspended material in 100,000 parts of water. The ratio of this amount to the total volume of the dry land is one to 9,730,000. If the dry land were a level plateau of 700 meters altitude, it would lose, by fluid erosion alone, a slice of about seven one-hundredths of a millimeter in thickness yearly, or one millimeter every fourteen years—say seven millimeters per century. “Here we have a definite figure, expressing the actual yearly continental erosion, showing that, if only this erosion were to operate, the entire mass of unsubmerged land would disappear in less than 10,000,000 years. “First, there is the erosion of the sea. It is impossible to select a better example of this than the Britannic isles; for they are exposed, by their situation, to the onslaught of the Atlantic, whose billows, driven by the prevailing southwest wind, meet with no obstacle to their progress. Now, the average recession of the English coast is certainly less than three meters per century. Let us apply this rate to the sea-coasts of the world, and see what will happen. “We may proceed in two ways: First, we may estimate the loss in volume for the entire coast-line of the world, on the basis of three centimeters per year. To do this, we should have to know the length of the shore-line and the mean height of the coast. The former is about 200,000 kilometers. As to the present average height of the coasts above the sea, 100 meters would certainly be a liberal estimate. Hence, a recession of three centimeters corresponds to an annual loss of three cubic meters per running meter, or, for the 200,000 kilometers of coast-line, 600,000,000 cubic meters, which is only six-tenths of a cubic kilometer. In other words, the erosion due to the sea would only amount to one-seventeenth that of the rivers. “It may perhaps be objected, that, as the altitude actually increases from the coast-line toward the interior, the same rate of recession would, in time, involve a greater loss in volume. Is this objection well founded? No; for the tendency of the rain and water-courses being, as we have said, to lower the surface-level, this action would keep pace with that of the sea. “Again, the area of the dry land being 145,000,000 square kilometers, a circle of equal area would have a radius of 6800 kilometers. But the circumference of this circle would be only 40,000 kilometers; that is to say, the sea could exercise upon the circle but one-fifth the erosive action which it actually does upon the indented outline of our shores. We may, therefore, admit that the erosive action of the sea upon the dry land is five times greater than it would be upon an equivalent circular area. Certainly this estimate is a maximum; for it is logical to suppose that, when the narrow peninsulas have been eaten away by the sea, the ratio of the perimeter to the surface will decrease more and more—that is, the action of the sea will be less effective. In any event, since, at the rate of three centimeters per year, a radius of 6800 kilometers would disappear in 226,600,000 years, one-fifth of this interval, or about 45,000,000 years, would represent the minimum time necessary for the destruction of the land by the sea; this would correspond to an intensity of action scarcely more than one-fifth that of the rivers and rain. “Taken together, these mechanical causes would, therefore, involve every year a loss in volume of twelve cubic kilometers, which, for a total of 100,000,000, would bring about the complete submergence of the dry land in a little more than 8,000,000 years. “But we are far from having exhausted our analysis of the phenomena in question. Water is not only a mechanical agent; it is also a powerful dissolvent, far more powerful than we might suppose, because of the large amount of carbonic acid which it absorbs either from the atmosphere or from the decomposed organic matter of the soil. All subterranean waters become charged with substances which it has thus chemically abstracted from the minerals of the rocks through which it percolates. “River water contains, per cubic kilometer, about 182 tons of matter in solution. The rivers of the world bring yearly to the sea, nearly five cubic kilometers of such matter. The annual loss to the dry land, therefore, from these various causes, is seventeen instead of twelve cubic kilometers; so that the total of 100,000,000 would disappear, not in eight, but in a little less than six million years. “This figure must be still further modified. For we must not forget that the sediment thus brought to the sea and displacing a certain amount of water, will cause a rise of the sea-level, accelerating by just so much the levelling process due to the wearing away of the continents. “It is easy to estimate the effect of this new factor. Indeed, for a given thickness lost by the plateau heretofore assumed, the sea-level must rise by an amount corresponding to the volume of the submarine deposit, which must exactly equal that of the sediment brought down. Calculation shows that, in round numbers, the loss in volume will be twenty-four cubic kilometers. “Having accounted for an annual loss of twenty-four cubic kilometers, are we now in a position to conclude what time will be necessary for the complete disappearance of the dry land, always supposing the indefinite continuance of present conditions? “Certainly, gentlemen; for, after examining the objection which might be made apropos of volcanic eruptions, we find that the latter aid rather than retard the disintegrating process. “We believe, therefore, that we may fearlessly accept the above estimate of twenty-four cubic kilometers, as a basis of calculation; and as this figure is contained 4,166,666 times in 100,000,000, which represents the volume of the continents, we are authorized to infer that under the sole action of forces now in operation, provided no other movements of the soil occur, the dry land will totally disappear within a period of about 4,000,000 years. “But this disappearance, while interesting to a geologist or a thinker, is not an event which need cause the present generation any anxiety. Neither our children nor our grandchildren will be in a position to detect in any sensible degree its progress. Such was the learnedly developed thesis of the president of the geological society of France. His calm and moderate statement of the secular action of natural forces, opening up a future of 4,000,000 years of life, had allayed the apprehension excited by the comet. The audience had become wonderfully tranquillized. No sooner had the orator left the platform and received the congratulations of his colleagues than an animated conversation began on every side. A sort of peace took possession of every mind. People talked of the end of the world as they would of the fall of a ministry, or the coming of the swallows—dispassionately and disinterestedly. A fatality put off 40,000 centuries does not really affect us at all. “Ladies and gentlemen: I am about to lay before you a theory diametrically opposed to that of my eminent colleague of the Institute, yet based upon facts no less definite and a process of reasoning no less rigorous. The orator, gifted with an excellent voice, had perceived the disappointment settling upon every face. “Oh,” he said, “opposed, not as regards the time which nature allots to the existence of humanity, but as to the manner in which the world will come to an end; for I also believe in a future of several million years. “Only, instead of seeing the subsidence and complete submergence of the land beneath the invading waters, I foresee, on the contrary, death by drouth, and the gradual diminution of the present water supply of the earth. Some day there will be no more ocean, no more clouds, no more rain, no more springs, no more moisture, and vegetable as well as animal life will perish, not by drowning, but through lack of water. “On the earth’s surface, indeed, the water of the sea, of the rivers, of the clouds, and of the springs, is decreasing. Without going far in search of examples, I would remind you, gentlemen, that in former times, at the beginning of the quaternary period, the site now occupied by Paris, with its 9,000,000 of inhabitants, from Mount Saint-Germain to Villeneuve-Saint-Georges, was almost entirely occupied by water; only the hill of Passy at Montmartre and Pere-Lachaise, and the plateau of Montrouge at the Panthéon and Villejuif emerged above this immense liquid sheet. The altitudes of these plateaus have not increased, there have been no upheavals; it is the water which has diminished in volume. “It is so in every country of the world, and the cause is easy to assign. A certain quantity of water, very small, it is true, in proportion to the whole, but not negligible, percolates through the soil, either below the sea bottoms by crevices, fissures and openings due to submarine eruptions, or on the dry land; for not all the rain water falls upon impermeable soil. In general, that which is not evaporated, returns to the sea by springs, rivulets, streams and rivers; but for this there must be a bed of clay, over which it may follow the slopes. Wherever this impermeable soil is lacking, it continues its descent by infiltration and saturates the rocks below. This is the water encountered in quarries. “This water is lost to general circulation. It enters into chemical combination and constitutes the hydrates. If it penetrates far enough, it attains a temperature sufficient for its transformation into steam, and such is generally the origin of volcanoes and earthquakes. But, within the soil, as in the open air, a sensible proportion of the water in circulation becomes changed into hydrates, and even into oxides; there is nothing like humidity for the rapid formation of rust. Thus recombined, the elements of water, hydrogen and oxygen, disappear as water. Thermal waters also constitute another interior system of circulation; they are derived from the surface, but they do not return there, nor to the sea. The surface water of the earth, either by entering into new combinations, or by penetrating the lower rock-strata, is diminishing, and it will diminish more and more as the earth’s heat is dissipated. The heat-wells which have been dug within a hundred years, in the neighborhood of the principal cities of the world, and which afford the heat necessary for domestic purposes, will become exhausted as the internal temperature diminishes. The day will come when the earth will be cold to its center, and that day will be coincident with an almost total disappearance of water. “For that matter, gentlemen, this is likely to be the fate of several bodies in our solar system. Our neighbor the moon, whose volume and mass are far inferior to those of the earth, has grown cold more rapidly, and has traversed more quickly the phases of its astral life; its ancient ocean-beds, on which we, today, recognize the indubitable traces of water action, are entirely dry; there is no evidence of any kind of evaporation; no cloud has been discovered, and the spectroscope reveals no indication of the presence of the vapor of water. On the other hand, the planet Mars, also smaller than the earth, has beyond a doubt reached a more advanced phase of development, and is known not to possess a single body of water worthy of the name of ocean, but only inland seas of medium extent and slight depth, united with each other by canals. That there is less water on Mars than on the earth is a fact proved by observation; clouds are far less numerous, the atmosphere is much dryer, evaporation and condensation take place with greater rapidity, and the polar snows show variations, depending upon the season, much more extensive than those which take place upon the earth. Again, the planet Venus, younger than the earth, is surrounded by an immense atmosphere, constantly filled with clouds. As for the large planet Jupiter, we can only make out, as it were, an immense accumulation of vapors. Thus, the four worlds of which we know the most, confirm, each in its own way, the theory of a secular decrease in the amount of the earth’s water. “I am very happy to say in this connection that the theory of a general levelling process, maintained by my learned colleague, is confirmed by the present condition of the planet Mars. That eminent geologist told us a few moments ago, that, owing to the continuous action of rivers, plains almost horizontal would constitute the final form of the earth’s surface. That is what has already happened in the case of Mars. The beaches near the sea are so flat that they are easily and frequently inundated, as every one knows. From season to season hundreds of thousands of square kilometers are alternately exposed or covered by a thin layer of water. This is notably the case on the western shores of the Kaiser sea. On the moon this levelling process has not taken place. There was not time enough for it; before its consummation, the air, the wind and the water had vanished. “It is then certain that, while the earth is destined to undergo a process of levelling, as my eminent colleague has so clearly explained, it will at the same time gradually lose the water which it now possesses. To all appearances, the latter process is now going on more rapidly than the former. As the earth loses its internal heat and becomes cold, crevasses will undoubtedly form, as in the case of the moon. The complete extinction of terrestrial heat will result in contractions, in the formation of hollow spaces below the surface, and the contents of the ocean will flow into these hollows, without being changed into vapor, and will be either absorbed or combined with the metallic rocks, in the form of ferric hydrates. The amount of water will thus go on diminishing indefinitely, and finally totally disappear. Plants, deprived of their essential constituent, will become transformed, but must at last perish. “The animal species will also become modified, but there will always be herbivora and carnivora, and the extinction of the former will involve, inevitably, that of the latter; and at last, the human race itself, notwithstanding its power of adaption, will die of hunger and of thirst, on the bosom of a dried-up world. Such was the address of the permanent secretary of the academy of meteorology. The audience had listened with the deepest attention to both speakers, and it was evident, from its bearing, that it was fully reassured concerning the fate of the world; it seemed even to have altogether forgotten the existence of the comet. At this invitation, a young woman, elegantly dressed in the most perfect taste, ascended the tribune. This new declaration, this announcement of a third hypothesis, produced in the audience an astonishment bordering upon stupor. “Nor do I believe,” the graceful orator hastened to add, “that the final catastrophe can be set down to the comet, for I agree with my two eminent predecessors, that worlds do not die by accident, but of old age. “Yes, doubtless, gentlemen,” she continued, “the water will grow less, and, perhaps, in the end totally disappear; yet, it is not this lack of water which in itself will bring about the end of things, but its climatic consequences. The decrease in the amount of aqueous vapor in the atmosphere will lead to a general lowering of the temperature, and humanity will perish with cold. “I need inform no one here that the atmosphere we breathe is composed of seventy-nine per cent. of nitrogen and twenty per cent. of oxygen, and that of the remaining one per cent. about one-half is aqueous vapor and three ten-thousandths is carbonic acid, the remainder being ozone, or electrified oxygen, ammonia, hydrogen and a few other gases, in exceedingly small quantities. Nitrogen and oxygen, then, form ninety-nine per cent. of the atmosphere, and the vapor of water one-half the remainder. “But, gentlemen, from the point of view of vegetable and animal life, this half of one per cent. of aqueous vapor is of supreme importance, and so far as temperature and climate are concerned, I do not hesitate to assert that it is more essential than all the rest of the atmosphere. “The heat waves, coming from the sun to the earth, which warm the soil and are thence returned and scattered through the atmosphere into space, in their passage through the air meet with the oxygen and nitrogen atoms and with the molecules of aqueous vapor. These molecules are so thinly scattered (for they occupy but the hundredth part of the space occupied by the others), that one might infer that the retention of any heat whatever is due rather to the nitrogen and oxygen than to the aqueous vapor. Indeed, if we consider the atoms alone, we find two hundred oxygen and nitrogen atoms for one of aqueous vapor. Well, this one atom has eighty times more energy, more effective power to retain radiant heat, than the two hundred others; consequently, a molecule of the vapor of water is 16,000 times more effective than a molecule of dry air, in absorbing and in radiating heat—for these two properties are reciprocally proportional. “To diminish by any great amount the number of these invisible molecules of the vapor of water, is to immediately render the earth uninhabitable, notwithstanding its oxygen; even the equatorial and tropical regions will suddenly lose their heat and will be condemned to the cold of mountain summits covered with perpetual snow and frost: in place of luxurious plants, of flowers and fruits, of birds and nests, of the life which swarms in the sea and upon the land; instead of murmuring brooks and limpid rivers, of lakes and seas, we shall be surrounded only by ice in the midst of a vast desert—and when I say we, gentlemen, you understand we shall not linger long as witnesses, for the very blood would freeze in our veins and arteries, and every human heart would soon cease to beat. Such would be the consequences of the suppression of this half hundredth part of aqueous vapor which, disseminated through the atmosphere, beneficently protects and preserves all terrestrial life as in a hot-house. “The principles of thermodynamics prove that the temperature of space is 273° below zero. And this, gentlemen, is the more than glacial cold in which our planet will sleep when it shall have lost this airy garment in whose sheltering warmth it is today enwrapped. Such is the fate with which the gradual loss of the earth’s water threatens the world, and this death by cold will be inevitably ours, if our earthly sojourn is long enough. “This end is all the more certain, because not only the aqueous vapor is diminishing, but also the oxygen and nitrogen, in brief, the entire atmosphere. Little by little the oxygen becomes fixed in the various oxides which are constantly forming on the earth’s surface; this is the case also with the nitrogen, which disappears in the soil and vegetation, never wholly regaining a gaseous state; and the atmosphere penetrates by its weight into the land and sea, descending into subterranean depths. Little by little, from century to century, it grows less. Once, as for example in the early primary period, it was of vast extent; the earth was almost wholly covered by water, only the first granite upheaval broke the surface of the universal ocean, and the atmosphere was saturated with a quantity of aqueous vapor immeasurably greater than that it now holds. This is the explanation of the high temperature of those bygone days, when the tropical plants of our time, the tree ferns, such as the calamites, the equisetaceæ, the sigillaria and the lepidodendrons flourished as luxuriously at the poles as at the equator. Today, both the atmosphere and aqueous vapor have considerably diminished in amount. In the future they are destined to disappear. Jupiter, which is still in its primary period, possesses an immense atmosphere full of vapors. The moon does not appear to have any at all, so that the temperature is always below the freezing point, even in the sunlight, and the atmosphere of Mars is sensibly rarer than ours. At this point the chancellor of the Columbian academy, who had come that very day from Bogota by an electric air-ship to participate in the discussion, requested permission to speak. It was known that he had founded on the very equator itself, at an enormous altitude, an observatory overlooking the entire planet, from which one might see both the celestial poles at the same time, and which he had named in honor of a French astronomer who had devoted his whole life to making known his favorite science and to establishing its great philosophical importance. He was received with marked sympathy and attention. “Gentlemen,” he said, on reaching the desk, “in these two sessions we have had an admirable resumé of the curious theories which modern science is in a position to offer us, upon the various ways in which our world may come to an end. The burning of the atmosphere, or suffocation caused by the shock of the rapidly approaching comet; the submergence of the continents in the far future beneath the sea; the drying up of the earth as a result of the gradual loss of its water; and finally, the freezing of our unhappy planet, grown old as the decaying and frozen moon. Here, if I mistake not, are five distinct possible ends. “The director of the observatory has announced that he does not believe in the first two, and that in his opinion a collision with the comet will have only insignificant results. I agree with him in every respect, and I now wish to add, after listening attentively to the learned addresses of my distinguished colleagues, that I do not believe in the other three either. “Ladies,” continued the Columbian astronomer, “you know as well as we do that nothing is eternal. In the bosom of nature all is change. The buds of the spring burst into flowers, the flowers in their turn become fruit, the generations succeed each other, and life accomplishes its mission. So the world which we inhabit will have its end as it has had its beginning, but neither the comet, nor water, nor the lack of water are to cause its death agony. To my mind the whole question hangs upon a single word in the closing sentence of the very remarkable address which has just been made by our gracious colleague, the president of the physical society. “The sun! Yes, here is the key to the whole problem. “Terrestrial life depends upon its rays. I say depends upon them—life is a form of solar energy. It is the sun which maintains water in a liquid state, and the atmosphere in a gaseous one; without it all would be solid and lifeless; it is the sun which draws water from the sea, the lakes, the rivers, the moist soil; which forms the clouds and sets the air in motion; which produces rain and controls the fruitful circulation of the water; thanks to the solar light and heat, the plants assimilate the carbon contained in the carbonic acid of the atmosphere, and in separating the oxygen from the carbon and appropriating the latter the plant performs a great work; to this conversion of solar into vital energy, as well as to the shade of the thick-leaved trees, is due the freshness of the forests; the wood which blazes on our hearthstones does but render up to us its store of solar heat, and when we consume gas or coal today, we are only setting free the rays imprisoned millions of years ago in the forests of the primary age. Electricity itself is but a form of energy whose original source is the sun. It is, then, the sun which murmurs in the brook, which whispers in the wind, which moans in the tempest, which blossoms in the rose, which trills in the throat of the nightingale, which gleams in the lightning, which thunders in the storm, which sings or wails in the vast symphony of nature. “Thus the solar heat is changed into air or water currents, into the expansive force of gases and vapors, into electricity, into woods, flowers, fruits and muscular energy. So long as this brilliant star supplies us with sufficient heat the continuance of the world and of life is assured. “The probable cause of the heat of the sun is the condensation of the nebula in which this central body of our system had its origin. This conversion of mechanical energy must have produced 28,000,000 degrees centigrade. You know gentlemen, that a kilogram of coal, falling from an infinite distance to the sun, would produce, by its impact, six thousand times more heat than by its combustion. At the present rate of radiation, this supply of heat accounts for the emission of thermal energy for a period of 22,000,000 years, and it is probable that the sun has been burning far longer, for there is nothing to prove that the elements of the nebula were absolutely cold; on the contrary they themselves were originally a source of heat. The temperature of this great day-star does not seem to have fallen any; for its condensation is still going on, and it may make good the loss by radiation. Nevertheless, everything has an end. If at some future stage of condensation the sun’s density should equal that of the earth, this condensation would yield a fresh amount of heat sufficient to maintain for 17,000,000 years the same temperature which now sustains terrestrial life, and this period may be prolonged if we admit a diminution in the rate of radiation, a fall of meteorites, or a further condensation resulting in a density greater than that of the earth. But, however far we put off the end, it must come at last. The suns which are extinguished in the heavens, offer so many examples of the fate reserved for our own luminary; and in certain years such tokens of death are numerous. “But in that long period of seventeen or twenty million years, or more, who can say what the marvellous power of adaptation, which physiology and paleontology have revealed in every variety of animal and vegetable life, may not do for humanity, leading it, step by step, to a state of physical and intellectual perfection as far above ours, as ours is above that of the iguanodon, the stegosaurus and the compsognathus? Who can say that our fossil remains will not appear to our successors as monstrous as those of the dinosaurus? Perhaps the stability of temperature of that future time may make it seem doubtful whether any really intelligent race could have existed in an epoch subjected, as ours is, to such erratic variations of temperature, to the capricious changes of weather which characterize our seasons. And, who knows if before that time some immense cataclysm, some general change may not bury the past in new geological strata and inaugurate new periods, quinquennial, sexennial, differing totally from the preceding ones? “One thing is certain, that the sun will finally lose its heat; it is condensing and contracting, and its fluidity is decreasing. The time will come when the circulation, which now supplies the photosphere, and makes the central mass a reservoir of radiant energy, will be obstructed and will slacken. The radiation of heat and light will then diminish, and vegetable and animal life will be more and more restricted to the earth’s equatorial regions. When this circulation shall have ceased, the brilliant photosphere will be replaced by a dark opaque crust which will prevent all luminous radiation. The sun will become a dark red ball, then a black one, and night will be perpetual. The moon, which shines only by reflection, will no longer illumine the lonely nights. Our planet will receive no light but that of the stars. The solar heat having vanished, the atmosphere will remain undisturbed, and an absolute calm, unbroken by any breath of air, will reign. “Not exactly,” replied the Columbian chancellor. “It is not cold which produces glaciers,—it is heat. “If the sun did not evaporate the sea water there would be no clouds, and but for the sun there would be no wind. For the formation of glaciers a sun is necessary, to vaporize the water and to transport it in clouds and then to condense it. Every kilogram of vapor formed represents a quantity of solar heat sufficient to raise five kilograms of cast-iron to its fusing point (110°). By lessening the intensity of the sun’s action we exhaust the glacier supply. Another voice, that of a celebrated electrician, was heard from the center of the hemicycle. “All these theories of death by cold,” he observed, “are plausible. But the end of the world by fire? This has been referred to only in connection with the comet. It may happen otherwise. “Nor I, either,” replied the electrician. “When I say ‘will,’ I mean an ideal, invisible force. Let me explain. “To resume,” continued the director of the Paris observatory, “after all we have just now heard, we see that our planet will be at a loss to choose among so many modes of death. I have as little fear now as before of any danger from the present comet. But it must be confessed that, solely from the point of view of the astronomer, this poor, wandering earth is exposed to more than one peril. The child born into this world, and destined to reach the age of maturity, may be compared to a person stationed at the entrance to a narrow street, one of those picturesque streets of the sixteenth century, lined with houses at whose every window is a marksman armed with a good weapon of the latest model. This person must traverse the entire length of the street, without being stricken down by the weapons levelled upon him at close range. Every disease which lies in wait and threatens us, is on hand: dentition, convulsion, croup, meningitis, measles, smallpox, typhoid fever, pneumonia, enteritis, brain fever, heart disease, consumption, diabetes, apoplexy, cholera, influenza, etc., etc., for we omit many, and our hearers will have no difficulty in supplementing this off-hand enumeration. Will our unhappy traveller reach the end of the street safe and sound? If he does, it will only be to die, just the same. Just as the speaker was uttering these last words, a voice, which seemed to come from a distance, fell, as it were, from the ceiling overhead. But a few words of explanation may here perhaps be desirable. As we have said, the observatories established on the higher mountains of the globe were connected by telephone, with the observatory of Paris, and the sender of the message could be heard at a distance from the receiver, without being obliged to apply any apparatus directly to the ear. The reader doubtless recollects that, at the close of the preceding session, a phonogram from Mt. Gaurisankar stated that a photophonic message, which would be at once deciphered, had been received from the inhabitants of Mars. As the translation of this cipher had not arrived at the opening of the evening session, the bureau of communications had connected the Institute with the observatory by suspending a telephonoscope from the dome of the amphitheater. As this picture could only be seen by holding the head in a very fatiguing position, the president touched a bell and an assistant appeared, who by means of a projector and mirror transferred these hieroglyphics to a screen on the wall behind the desk, so that every one could readily see and analyze them at their leisure. Their interpretation was easy; nothing indeed could be more simple. The figure representing the comet needed no explanation. The arrow indicates the motion of the comet towards a heavenly body, which as seen from Mars presents phases, and sparkles like a star; this means the earth, naturally so delineated by the Martians, for their eyes, developed in a medium less luminous than ours, are somewhat more sensitive and distinguish the phases of the Earth, and this the more readily because their atmosphere is rarer and more transparent. (For us the phases of Venus are just on the limit of visibility.) The double globe represents Mars looking at the Kaiser sea, the most characteristic feature of Martian geography, and indicates a velocity for the comet double the orbital velocity, or a little less, for the line does not quite reach the edge. The flames indicate the transformation of motion into heat; the aurora borealis and the lightning which follow, the transformation into electric and magnetic force. Finally, we recognize the boot of Italy, visible from Mars, and the black spot marks the locality threatened, according to their calculation, by one of the most dangerous fragments of the head of the comet; while the four arrows radiating in the direction of the four cardinal points of the compass seem to counsel removal from the point menaced. The photophonic message from the Martians was much longer and far more complicated. The astronomers on Mt. Gaurisankar had previously received several such, and had discovered that they were sent from a very important, intellectual and scientific center situated in the equatorial zone not far from Meridian bay. The last message, whose general meaning is given above, was the most important. The remainder of it had not been transmitted, as it was obscure and it was not certain that its exact meaning had been made out. The president rang his bell for order. He was about to sum up what had been said, before adjourning the meeting. “Gentlemen,” he began, “although it is after midnight, it will be of interest, before we separate, to summarize what has been told us in these two solemn sessions. “The last despatch from Gaurisankar may well impress you. It seems clear that the inhabitants of Mars are farther advanced in science than ourselves, and this is not surprising, for they are a far older race and have had centuries innumerable in which to achieve this progress. Moreover, they may be much more highly organized than we are, they may possess better eyes, instruments of greater perfection, and intellectual faculties of a higher order. We observe, too, that their calculations, while in accord with ours as to the collision, are more precise, for they designate the very point which is to receive the greatest shock. The advice to flee from Italy should therefore be followed, and I shall at once telephone the Pope, who at this very moment is assembling the prelates of entire Christendom. “So the comet will collide with the earth, and no one can yet foresee the consequences. But in all probability the disturbance will be local and the world will not be destroyed. The carbonic-oxide is not likely to penetrate the respirable portions of the atmosphere, but there will be an enormous development of heat. “As to the veritable end of the world, of all the hypotheses which today permit us to forecast that event the most probable is the last—that explained to us by the learned chancellor of the Columbian academy: the life of the planet depends upon the sun; so long as the sun shines humanity is safe, unless indeed the diminution of the atmosphere and aqueous vapor should usher in before that time the reign of cold. In the former case we have yet before us twenty million years of life; in the latter only ten.